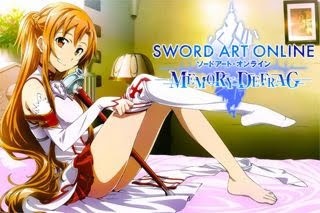 Here's a quick FAQ guide for the new event from the action RPG mobile game - SAO: MD. - Extremely hard if you don't have a handful of 4*~6* characters, and/or at least 3* healers. - This event is more like a challenge event for P2P or semi-P2P players, giving all of their characters a chance to shine, instead of only using a select few, like in ranking events. - Veteran F2P players with quite a number of 4*~5* units and free characters can also join and clear floors that they can reach. - There are 5 Areas, and 1 Area = 20 Floors. - Bosses will usually appear on areas that only have 2 floors between 2 Break Points, so plan ahead. - Some floors will also spawn rabbits instead of the usual enemies. What is a Break Point? - Each Area has a number of Break Points (usually 7). - Break Points are your resting points (HP and MP replenishes), and where you can create teams for the next floors. - Characters that are able to reach these Break Points will get -1 Departure. What is "Number of Departure"? - Each character will get 2 Departures by default, but some will get more. 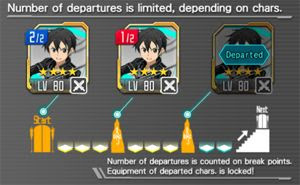 - Departures is equal to the number of times you can use that character in your team, if they reach 0 Departures, you can longer use them for the rest of that Area. - This depends per event, so check the notification section in-game to learn more. - Usually, new banner scouts will get 3 Departures. What Will Happen If My Character/s Dies? - Dead characters can no longer help you for the rest of that Area. If you want to restore their status, you need reach or return to the Transport Gate. What is a Transport Gate? - The entrance for every area, you can also reach it once you defeat the final Boss of that area. What Will Happen If I "Give Up" During Battle? - This is like a retreat option, but dead characters will stay dead, and characters who survived will get -1 Departure. - Your team's HP and the HP of enemies or Boss will also restore to 100%. All of My Characters Are Dead? What To Do Now? - Sadly, you can no longer continue to that Area, you need to return to the Transport Gate and re-do everything! Yes, this is the most annoying part, because if you failed at the final Boss fight, you need to re-run all 19 stages again. - You cannot revive or continue. - All gears used by your characters will get locked unless you return to or reach the Transport Gate. - Here you can check the recommended Weapon Type and Element for the next floors. - Outbreak! = means it's gonna be full of mobs and/or tough monsters, so use characters with wide AoE attacks or hard hitters to make things easier. - NEUTRAL (Non-Elementals are unaffected by elements, therefore they don't have any weakness. However, there are units that can deal more damage to Neutral Element monsters). - Note: If the Info says "Better for Wind", that also means that it is not recommended to take Water characters because most enemies will be Earth element. - This is really really helpful for Boss fights, because the damage reduction your characters will receive is significantly reduced! - When choosing Dark and Holy units, be careful though because they can still receive higher damages against their counter element. Damage Reduction: Event Accessories NEW! - You can also farm certain free accessories from events, that can be used to reduce damages by 10%. Note that these accessories are limited only to the next floor clearing event. - Best if you equip them to your sturdy characters (element wise) to further reduce damages. - Thrust/Pierce/Stab - Rapiers, Lances, Daggers, and Bows. - Note: If the Info says "Better for Thrust", that also means that it is not recommended to take Slash type characters. - Quickly eliminate fast moving or high damaging enemies first, while dodging their attacks. Parry if you can too but it's way better to dodge and defeat monsters 1 at a time (if needed), especially against those Slimes. - Before the next floor or next wave of enemies, try to restore your team's HP and MP using that last standing enemy, preferably the slower ones. - Buff your team with Defense+ and/or Attack+ (optional: quickly regen MP using the last standing enemy). - If you only have few 6*~4* units, you might want run using 1 or 2 units + a healer to conserve your character's number of Departures. - Aside from the usual DPS type characters, here's some notable ones that you might want to consider. - Use healers to support your teams, especially when you are using characters that's doesn't have any defensive skills like auto-heal, barrier, damage reduction bonuses, and more. - Yup, these units are excellent for Boss fights, since almost all Bosses especially at Floor 80+ will get very high defense and attack. If possible, use one that can debuff Attack and Defense of enemies. - It looks like Mace users can also shine here, because of their large HP pool and Defense. Packs good damages, especially against elemental and skeletons, plus you have all the time to recover their MP. - There are also some other units that gets damage reduction at certain HP%, (ex: characters from "Sailor-Suited" series), these units are pretty tanky, especially when used against their counter element, even nastier if buffed with Defense+, then Debuff the Boss with Attack Down!! - Refer here for a List of Tanks and Damage Mitigators. Are 3* Characters Viable Here? - Yup, sure but not all, and since their effectiveness is limited, they can only help your team for the first few floors. - I would highly recommend 3* Healers like: Leafa [Wind Mage], Seven [The Young Pooka], Alicia Rue, and Siune. Max them out and at least get some R3 gears to increase their MP and Healing Amount (Attack Stat). - Can be used even at higher floors, if your team needs some healing support. - Since Elementals and Skeletons are pretty slow, these characters can also do some decent damage. - If you still don't have any Strike units, then max them out and equip your spare R3 or R4 gears. - Other 3 Star units are also ok if you have decent gears for them, but only effective for the first few floors though. Just take advantage of your enemies' Weapon Type and Elemental Weaknesses to increase their damage output. - So, since most beginners and F2P players can't join the front-lines, here's some things that you can still do for this event. 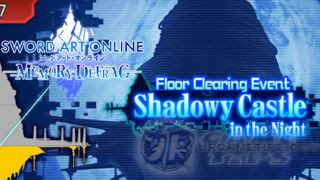 - Clear floors that you can and try to reach Rank S, this way you can get more Memory Diamonds. - Clearing the first few floors will also net you some nice rewards like Memory Fragments, earn them until you are able to exchange them for gears. - Check Score Rewards, and aim to get them all by clearing floors for event points. - Aside from the usual items, here's some new rewards that you can also get. - Floor Clearing Rewards gives up to 20 Memory Fragment. 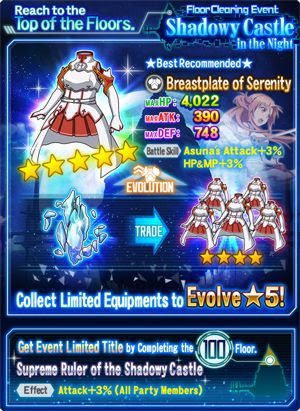 Exchange these Fragments to obtain limited equipments that can be evolved to 5*! - Check Armors List Section for more info. - Floor rewards can only be obtained 1 time, to farm more Memory Fragments, wait for the next similar event.